All Digiscope platforms feature extremely large displays and advanced interaction devices, and will all be interconnected by a telepresence system supporting live audio-video links and real-time sharing of content. Each platform is unique, to address the specific needs of the different partners and application area. Despite such heterogeneity, the network is designed to support remote collaboration while taking advantage of their unique characteristics. The main differences between platforms include the type, size and resolution of the displays, their ability to display 3D content and to support multitouch, and the availability of 3D motion capture systems. 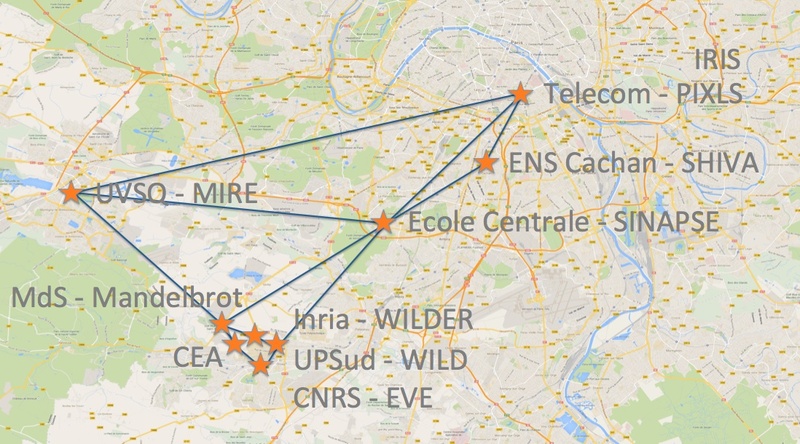 The ten platforms are located across Université Paris-Saclay campus, with locations on the Plateau de Saclay (Saclay, Gif-sur-Yvette, Orsay) and in Paris, Cachan, Chatenay-Malabry and Versailles. WILD Ultra-high resolution wall-sized display with motion tracking. EVE Large immersive, multi-sensorimotor and multi-user CAVE system PIXLS Large multi-touch wall-sized display IRIS Mid-size multitouch wall display. SHIVA Large stereoscopic power wall. Mandelbrot Very large stereoscopic display MIRE Large stereoscopic display in a unique curved configuration. WILDER Very high-resolution multitouch wall-sized display with a motion tracking system. Sinapse 4K powerwall with 3D display and a multitouch table. VIKI Immersive 5-side CAVE with whole-body tracking and two haptic arms FABLAB DIGISCOPE Digital Fabrication Laboratory. Open to everyone. 100 sm. 15 digitally-controlled machines .Click (link: http://fablabdigiscope.wordpress.com text: here) to book your first visit (15 min).